For anyone who dives into lucid dreaming and tries to encounter the unconscious forget that the unconscious aspect of our minds contains emotionally troubling themes and imagery. These fearful based experiences often manifest themselves in troubling ways which can piggyback on a natural process that happens to each of us every night, the paralysis that our bodies are put into naturally by our brains. This combined phenomenon is called sleep paralysis and is common among lucid dreamers. Sleep paralysis is so common among lucid dreamers that I have found that discussing sleep paralysis and the hallucinations should be done before individuals start to practice lucid dreaming. Understanding what sleep paralysis is can relieve some of the anxiety when you go through the experience yourself. 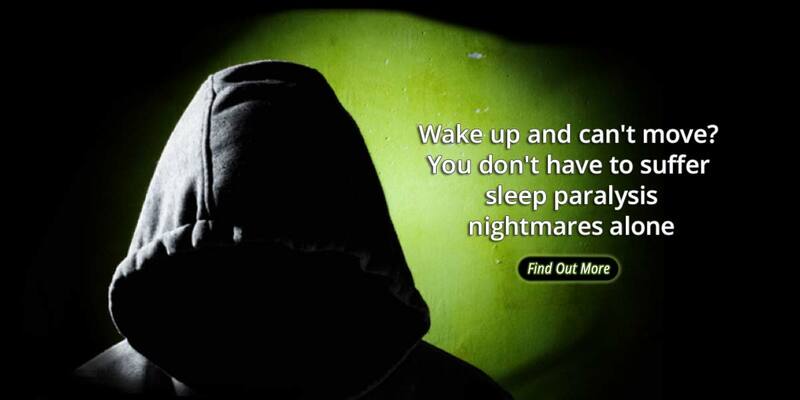 Sleep paralysis is put into place so that we don’t act out and can remain safe while we dream. Sleep paralysis is the process of being aware while your brain naturally paralyzes your body to get it ready for dreaming. Though sleep paralysis is known for its paralysis like effects which by itself can be terrifying for those who don’t understand what is happening to them, the more troubling experience is in the hallucinations that can follow, including physical, emotional, auditory, and visual dramatizations of our deepest fears. The key to preparing yourself for these often nightmarish like experiences of sleep paralysis which is common with lucid dreaming is by understanding why the fear is generated in the first place. I have been researching sleep paralysis since my first terrifying experience with the phenomenon. I was living by myself in an old house in Virginia while working in the military. What I thought was my friend ended up jumping on my back and pushing me down into my bed to the point I could not move. Eventually, I was able to break out of the pressure he seemed to exert down on me, but as I was able to move I noticed I was suddenly alone in my room. This terrified me because at the time I didn’t understand what had just occurred. It took me months of research and reading to understand what sleep paralysis was and after a number of terrifying additional experiences with sleep paralysis over a series of nights, I managed to stand up to my fears produced by the hallucinations which removed its power over my dreams. Sleep paralysis happens when our bodies are going to sleep but we are still partially awake. This happens because of our brains transition between REM and NREM and while we are going through that transition we are often still dreaming. Sometimes we are aware of that transition while it takes place, and the result is often terrifying hallucinations which can range from visitors coming into our rooms, to the basic feeling of being watched. Another aspect of sleep paralysis is that the paralysis part of the experience is caused by REM activation. According to Dr. Rubin Naiman a psychologist, clinical assistant professor of medicine and the sleep and dream specialist at the University of Arizona’s Center for Integrative Medicine, REM is emotionally driven. He says that the more that you react with fear the more that it draws us into REM and the worse the experience can get. The idea here is to not react but to relax. Here is a nice article talking about things we see during NREM that is published by a peer-reviewed source. Because we are still able to dream in these states we can often experience dreams that are a bit different than when we are fully unconscious. Usually, sleep paralysis is described as a combination of the feeling of being paralyzed and the feeling of a presence or the visualization of terrifying creatures. Being paralyzed during sleep is scary but it’s also natural. Our bodies put us to sleep every night so that we don’t act out the dreams to our significant others or peering neighbor. Sleepwalking is an example of this mechanism not working during sleep. Exploring more into this topic, scientist conducted studies where they removed the part of a cat’s brain called the pons, and watch cats essentially sleepwalk. The cats would act as though they were awake chasing what seemed to be imaginary mice. Luckily for us, we still have our pons but unfortunately, sometimes our don’t work just right. While we are in this paralysis state we can wake up and also hallucinate images in our environment. These hallucinations occur because we are still partially asleep and are able to dream our internal experiences on top of reality. Sleep paralysis is a lot like augmented reality for the brain. I fully understand how terrifying sleep paralysis can be because I have first-hand experience with its effects for many years. I have tried everything that I could think of to try to get rid of the experience from happening. Eventually, I had to face the fact, that if I was to continue my dream work I would have to face the experience and overcome the fear that it produced. The power of fear is maybe the strongest thing that anyone can experience. Fear makes us do amazing and terrifying things. Fear can easily be seen in everyday life used as a motivational tool in the media, marketing, and war. What sleep paralysis does for those of us who are exploring our consciousness is to allow us to come face to face with the most fearful experiences we can possibly imagine. Because of this fear being a simulated and not real, if you are able to stand up to those experiences or accept the fear for what it is and take the power away from the fear itself, you can use this to overcome one of the most profound obstacles that you could encounter not only in your waking life but also in your dreams. In Tibetan Book of The Dead and in the Egyptian book of The Dead this fear is described as the Gatekeeper to the afterlife. In the more recent text, Carl Jung discusses overcoming the shadow self which is an archetype of this fear, by identifying it as an aspect of the self and merging with it. There is also an alchemical text that talks about overcoming this fear, practices in Masonry, and even religious practices in Christianity that talk about overcoming this fear with the power of Jesus and God. Accepting the experience for what it is is a large part of overcoming sleep paralysis. Often we fear the unknown or the outcome of the unknown. If we are unsure of the result of an action we are thinking about taking then we may take a pause to invoke a fear based on the possible loss of control we have over the situation. Accepting the unknown and the loss of control we have over an aspect of our situation often removes the fear of the situation. Sleep paralysis and the events that take place during the experience are a test that the unconscious is using to determine if you are ready and willing to move past trying to control aspects of yourself you do not have control over. It tests us by putting us into the most vulnerable situations possible and allowing our imaginations do the rest. Imagine yourself if you went to a scary movie, and you knew all the parts of the movie including the ending. It wouldn’t be nearly as scary for you to watch it in this way, it even may ruin the fun. The same goes for sleep paralysis. If you accept that the experience is going to be strange, scary, and odd, you can accept that there will be scary parts but that those experiences are simply because you don’t understand them. If you choose to make the effort to understand the experience, it removes the power of fear from the equation. This in results removes your fear. Another example is to imagine yourself having a conversation with someone you don’t like. You may be fearful of the conversation because you don’t understand how that person will react to what you have to say, or you may be fearful of violence etc. If you simply took the time to hear that person out rather than impose your views onto that person, then you would learn that the person may have the same fears as you and you both are reacting to the conversation with fear. Essentially we are fearful of our own expectations, or our reflection that we see in the person or event. Overall what I am getting at here is that when it comes to sleep paralysis and the fear behind it is that we are simply reacting from a point of misunderstanding, something that can be overcome by simply accepting the experience rather than reacting. The initial reaction is to react in fear or anger, but resisting that initial desire to invoke fear, taking the higher ground, and becoming a mediator in your dream experience, will result in the fear going away. When we are experiencing sleep paralysis our minds are on the verge of waking and dreaming all at the same time. This is a perfect time to identify with yourself that you are aware while dreaming or lucid dreaming. Holding onto that awareness that comes with sleep paralysis, you can jumpstart the lucid dreaming process by allowing the dream to take place while having the continued awareness. In this manner sleep paralysis can also become a great way to lucid dream if you are able to overcome the fearful aspects of the experience. I like to use sleep paralysis for lucid dreaming for this very reason and I often work to try to induce sleep paralysis with lucid dreaming induction techniques. I am not personally a religious person, but I understand that others are and that their religious beliefs give them power. I say use whatever tools you have to overcome this fear because you will be much stronger as a person because of it. Not only will you take back your sleep, but you will overcome fears in your life that normally would not have been impossible. Truly nothing is scarier than sleep paralysis. It may take you a few times to overcome the experiences you have during sleep paralysis (initially it took me 3 times to finally get enough gumption to overcome it) and it may continue to happen (I still have sleep paralysis time to time), but one thing will be true, you will never look at fear the same way.